I am not an eggnog fan. 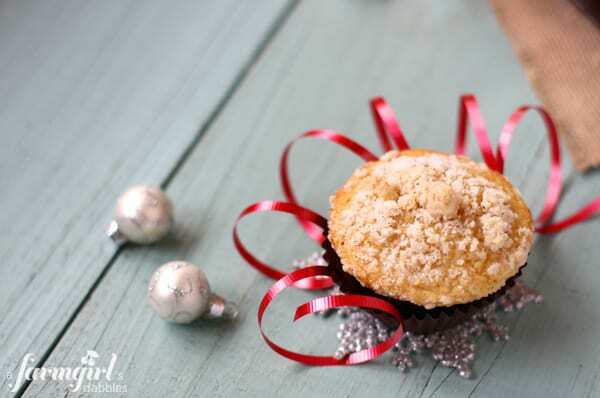 But these Spiced Eggnog Muffins with Streusel Topping absolutely thrill me! Growing up, a carton of eggnog could always be found in the refrigerator during the holidays. I remember Mom, who is especially fond of nutmeg, giving herself rationed permission to indulge in this annual tradition. But my avoidance of eggnog isn’t about the fat and cholesterol that Mom was concerned with. It all comes down to texture for me. It’s just a little too thick for me to drink straight-up. But I do like the flavor. Alot. So eggnog makes the perfect baking ingredient for me during the holidays! 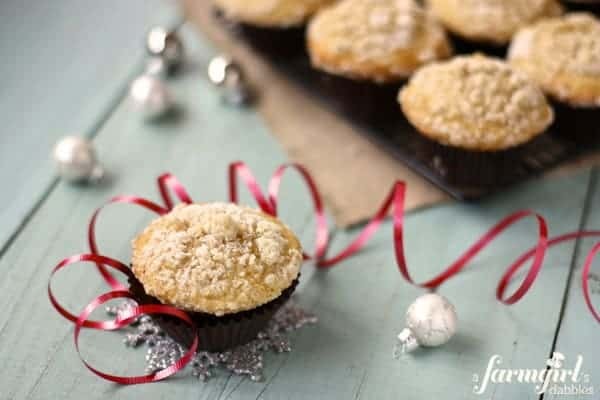 These eggnog muffins come together quickly, and would make your Christmas morning breakfast ever so fantastic. Our girls LOVE them. 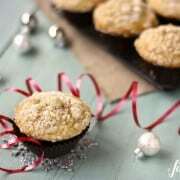 The muffins are extra moist and dense and flavorful from the eggnog. And then a crunchy little streusel, flecked with a bit more nutmeg, caps it all off. Streusel topping is my muffin joy. Merry, merry, merry to you and you and YOU! Be sure to check out my grandma’s recipe for Blueberry Muffins with Crumb Topping, a longtime favorite! Preheat oven to 375°. Line 12 regular size muffin cups with paper liners and set aside. In a medium bowl, combine flour, sugar, baking powder, cinnamon, nutmeg, and cloves. Make a well in the center of flour mixture and set aside. In another medium bowl, combine eggs, eggnog, butter, and vanilla. Add mixture all at once to flour mixture. Stir just until moistened. Batter will be a bit lumpy. Divide batter between prepared muffin cups. In a small bowl, combine flour, sugar, nutmeg, and salt. Using a rigid pastry blender or fork, cut in butter until mixture resembles coarse crumbs. Sprinkle topping over muffin batter. Bake for about 18 minutes, or until golden and a wooden toothpick inserted in centers comes out clean. Cool in pan on a wire rack for 5 minutes. Remove from pan and serve warm. Adapted from Midwest Living magazine, December 2008, originally from the Washington House Inn in Cedarburg, WI.